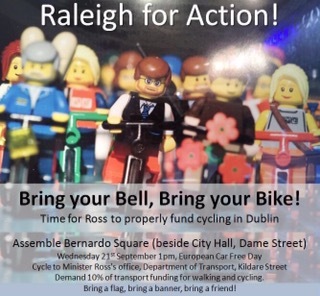 A lunchtime cycling protest rally is planned to go from Dublin City Hall to the Department of Transport, this Wednesday at 1pm. The stated goal of the event is to look for 10% of transport funding to go to cycling infrastructure, but the protest also follows a number of cycling deaths and serious injuries. The group will gather at Bernardo Square beside Dublin City Hall on Dame Street before traveling to the Department of Transport on Kildare Street. It is understood that the event is organised by the Green Party but is not focused on being party political. sounds like a good idea, but I have a feeling that looking for 10% wont go down well with the cyclist don’t pay Road tax brigade. Fairness feels like oppression when one is used to privileges. I guess they will just have to get over themselves. So if this proposal is successful, who is going to supervise the manner in which the funding gets spent? The Department of Transport, Tourism and Sport does not accept that it has a supervisory role over local authority engineers. What is to stop such engineers from using the 10% funds for “business as usual” aka “managing and controlling cyclists and pedestrians for the benefit of motor traffic”?